A color commentator is a North American term for a sports commentator who assists the main commentator, often by filling in any time when play is not in progress. In other regions this role is variously referred to as an analyst or summariser. The color analyst and main commentator will often exchange comments freely throughout the broadcast, when the play-by-play announcer is not describing the action. The color commentator provides expert analysis and background information, such as statistics, strategy and injury reports on the teams and athletes, and occasionally anecdotes or light humor. Color commentators are often former athletes or coaches of the sport being broadcast. Commentary teams typically feature one professional commentator describing the passage of play, and another, usually a former player or coach, providing supplementary input as the game progresses. The color commentator will usually restrict his input to periods when the ball or puck is out of play or there is no significant action on the field and will defer to the main commentator whenever there is a shot on goal or other significant event, sometimes resulting in their being talked-over or cut short by the primary commentator. 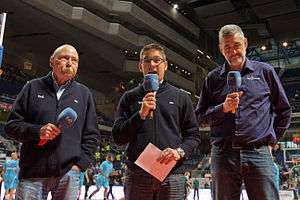 Additionally, former players and managers appear as pundits, carrying out a similar role to the co-commentator during the pre-game show preceding a given contest and the post-game show following it. In American motorsports coverage, there may be as many as two color commentators in the booth for a given broadcast. In the United Kingdom, the term "colour commentator" is relatively unknown; rather the role is called "analyst", "summariser" or simply "commentator". Cricket coverage on ESPNcricinfo uses similar terminology. In Australia, the term is not used. Those giving the analysis alongside the main commentator are sometimes said to be giving additional or expert analysis, or are "special comments", or may be referred to as "expert commentators". In Denmark, Norway and Sweden the term ekspertkommentator / expertkommentator (expert commentator) is used for a knowledgeable sidekick to the play-by-play announcer. ↑ "Color commentator | Define Color commentator at Dictionary.com". Dictionary.reference.com. Retrieved 2014-02-03. 1 2 "What Is a Color Commentator? | Everyday Life - Global Post". Everydaylife.globalpost.com. Retrieved 2014-02-03. ↑ "What Is a Color Commentator? | Chron.com". Work.chron.com. 2010-11-29. Retrieved 2014-02-03. ↑ "Announcers : Occupational Outlook Handbook : U.S. Bureau of Labor Statistics". Bls.gov. 2014-01-08. Retrieved 2014-02-03. ↑ "Color Commentary and Play by Play: A Well-Rounded Approach to Facebook". Inkling Media. 2012-05-02. Archived from the original on 2014-01-16. Retrieved 2014-02-03. ↑ "The Sportscaster: A Brief History & Job Description". Americansportscastersonline.com. 2014-01-07. Retrieved 2014-02-03. ↑ "The Top Three Keys For Becoming a Color Commentator | Sportsideo.com member John Lund". Sportsideo.com. 2012-11-27. Archived from the original on 2014-01-16. Retrieved 2014-02-03. ↑ Kedzie, Julie (2013-07-18). "Julie Kedzie Breaks Down the Art of MMA Color Commentary | FIGHTLAND". Fightland.vice.com. Retrieved 2014-02-03.